The consolidation that began in 2015 has coiled up nicely and led us to identify two leading breakout scenarios. 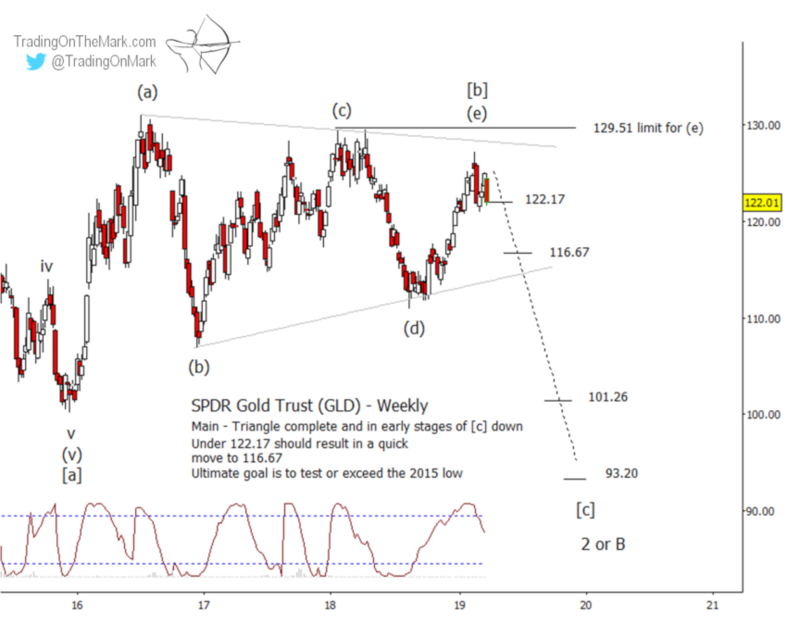 In this post we describe the main Elliott wave scenario for the SPDR Gold Trust (NYSEARCA: GLD). Meanwhile the forthcoming edition of our newsletter explains the main and alternate scenario for GLD and futures. If the consolidation has been an Elliott wave triangle as we believe, then the minimum conditions for the triangle’s completion have been met. The move out of the triangle should be downward, and it could be strongly impulsive. The support levels on the GLD chart below – our main GLD scenario – show big-picture targets that wave [c] should interact with if a declining wave [c] proceeds from the current price level. Initial confirmation would come with a weekly close beneath 122.17, and a break of that level should lead price quickly to 116.67. Preliminary lower targets include 101.26 and 93.20, but we view 116.67 as the safer target.